I was excited when I saw the description on the menu as a Wagyu burger. But the burger was was somewhat flavorless and then the kitchen overwhelmed the limited flavor with the cheese. The highlight of the burger was the bun, which was excellent. The fries were under-cooked, still slightly hard on the interior but were nicely salted. Overall the burger at Sole was very disappointing. As I worked my way through the myriad of restaurants and bars serving hamburgers in Fairfield County, the name Flipside arose more often than not. I ordered my normal bacon cheeseburger at the bar, which was busy during the lunch rush. The burger was pretty good. The meat was juicy and had a decent flavor, definitely not up there with the grass fed burgers in the area. The bun was very good (would have been better if they grilled it a bit) and the burger was properly cooked. The patty itself was thin variety and very wide and the bun was large enough to handle its dimensions. The bacon should be avoided as it was incredibly salty and I needed to remove from the burger to taste the meat. Overall not a fantastic burger. 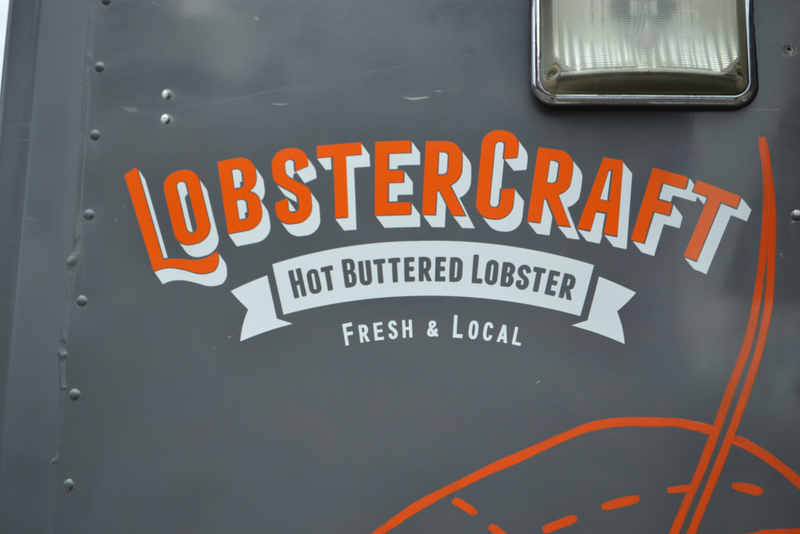 Lobstercraft features four different combinations. 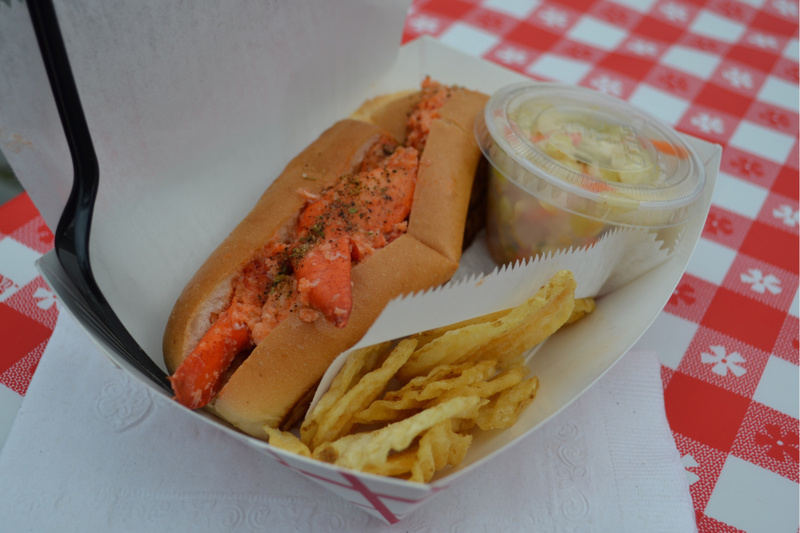 The basic “Coastal” includes buttered lobster claw meat (it looked like approx. 4 ounces) on a toasted bun or you can add some spicy butter and enjoy their “Heatwave”. And Captain Mike has two additional combinations up his sleeve. His “LBLT” adds bacon, lettuce & tomato) and the “California”tops the lobster meat with avocado, cucumber and a wasabi soy sauce. I chose a Coastal and some bisque. The lobster claw meat was delicious, moist, with good buttery flavor; but the ingredient that elevated the flavors was the “secret seasoning” on top. The sandwich also includes a side of truck-made spicy coleslaw, which adds little heat and was a great side for the roll. The Lobster Bisque was more broth than the creamy version I expected. Captain Mike adds a scoop of chopped lobster meat to the bisque at the last minute. A second visit is in the cards to try another cup of bisque plus I made grab some MAC. The location varies. I saw the truck on Bell Street at lunchtime the other day but you may also find it at Harbor Point. 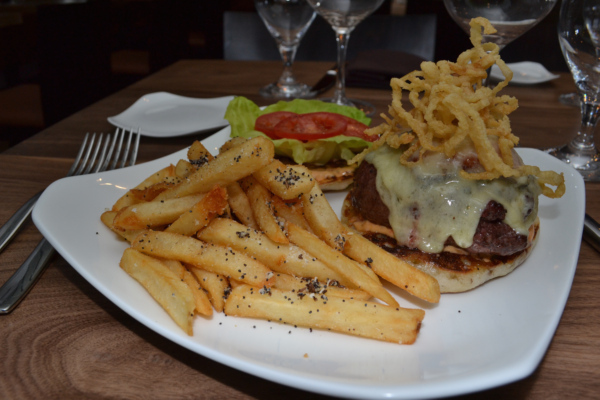 As my search for great bar burgers continues, I wandered up the street from my office to try Tavern on 7. Located just north of the DMV on the opposite side of the street, there is parking on the side and when I entered midway through lunch service the place was bustling with a full house. Evryone seemed to be enjoying their meal, including burgers, fish & chips, salads and sandwiches. I was there for a burger and the menu included five choices, an “Angus Cheeseburger,” a “All-Star Burger,” A “Veggie Burger,” a “Turkey Burger,” and my choice the “Tavern Brew Burger,” which included black angus beef topped with Fontina cheese, smoked bacon and caramelized onions. As I waited for the burger to arrive I was impressed with the energy and the chatter around me. This was a go-to spot for many. The burger arrived and after one bite my disappointment kicked in and nothing in the subsequent bites eliminated this first impression. The meat tasted as if water was added to give it a level of juiciness, the bacon was very basic and boring and the onions were more greasy than tasty. The bun was cold and right out of a plastic bag. I am glad others enjoyed more than me, but I am not anxious to return and have another burger. Harvest Wine Bar, located on the lower end of Greenwich Avenue, elevates the restaurant offerings in downtown Greenwich to a much higher level. The Sigueza brothers, Vicente and Kleber, can now add another fantastic restaurant to their portfolio, which includes Cave Wine Bar in New Canaan, Scena Wine Bar in Darien and 55 Wine Bar in Fairfield. A beautiful casual dining space in the front area is dominated by a large brick wall and accentuated with wood tables and chairs. You can continue walking to the rear of the restaurant and enjoy the long bar or tables, all with views through the large west-facing windows lining the entire rear wall of the restaurant. Overseeing the kitchen is Chef Eben Leonard who is migrating from Scena Wine Bar where CTbites enjoyed his creativity and culinary talent on numerous occasions. 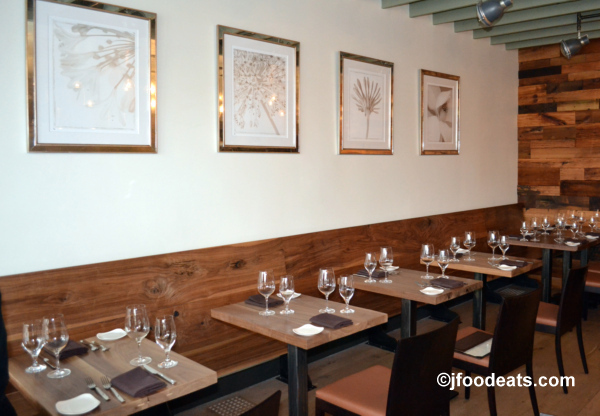 His opening menu combines aspects from southern Europe with a modern twist to American classics. “Snacks and Shares” to enjoy at the bar include a creative short rib mac and cheese, carpetbagger oysters with beef carpaccio, and grilled pork tenderloin sliders. ”Starters” include salads, crudos and seafood. The entrées (“Seconds”) include several pasta dishes (I was assured that theof other Ricotta Gnocchi Bolognese from Scena is duplicated), but the emphasis of the menu is wood-fired, grilled meats, poultry and seafood. I sampled three of the appetizers and two were outstanding. 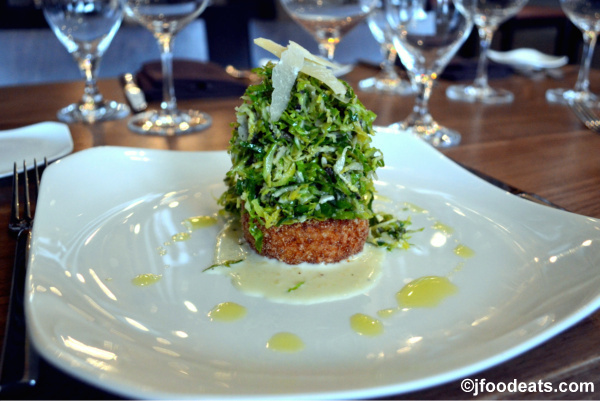 The “Shaved Brussel Sprout Salad” with a Parmesan risotto cake and truffle vinaigrette is delicious. The tower of Brussel sprout rests atop a warm parmesan risotto cake, surrounded by a small dollop of parmesan sauce. The focus of the dish is the shaved, raw Brussel sprouts, accented with olive oil, lemon, truffle oil and parmesan. The Brussel sprout and Parmesan cheese combination is a tremendous flavor combination; the bittersweet Brussels sprouts work exquisitely with the saltiness of the Parmesan cheese. Texturally, the dish includes the crunchiness of the raw Brussel sprouts, the cake’s exterior and slight bite from the risotto offset by the creaminess of the cake’s interior and the Parmesan sauce. 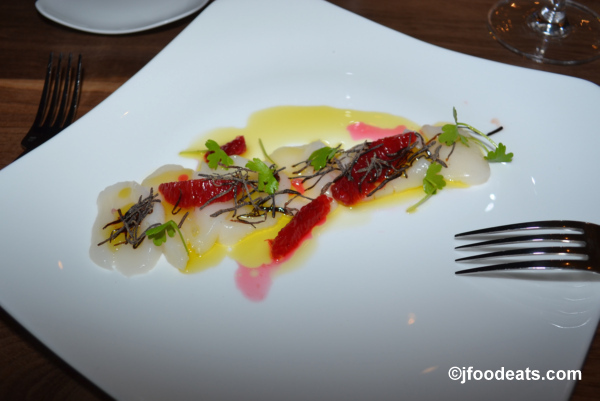 The “Scallop Crudo” with blood orange segments and topped with shredded Kombu (Japanese kelp) salt and micro greens is delightful and incredibly light. The mild flavors of the scallops are pleasantly complemented by the saltiness of the Kombu. The blood orange segments add a slight sweet-and-sour to the dish with a small amount of citrus. This was my introduction to Kombu and it reminds me of shredded beef jerky, offering a hearty saltiness. The addition of a few micro-greens adds a level of freshness to the dish. This is also an wonderful start to the meal. 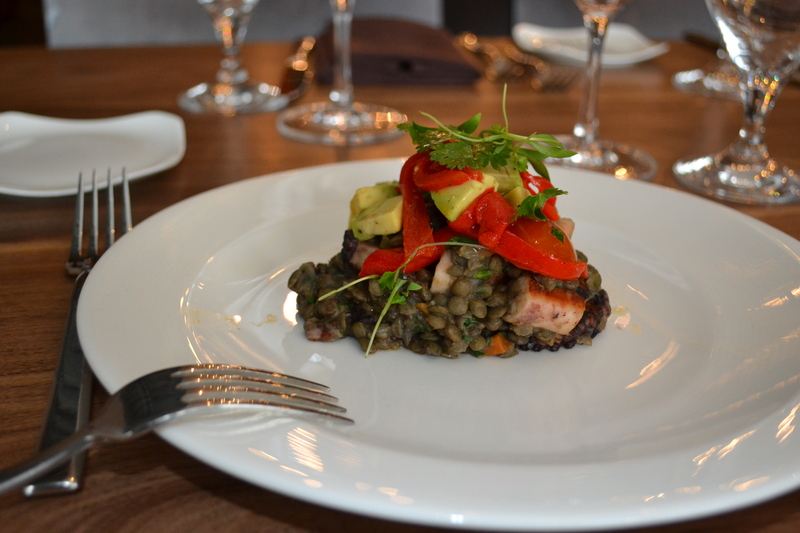 The “Charred Octopus” with red wine braised lentils, bacon, avocado, sweet Piquillo peppers and cherry tomatoes was not to my liking. The octopus itself is delicious, but the rest of the ingredients do not add to the overall dish; overall it lacks textural contrasts and many of the flavors meld together versus complementing. The bacon, peppers, tomatoes and cilantro attempt to add contrast and flavors but the avocado is subsumed by the lentils. Both of the two entrées that I sampled were outstanding. 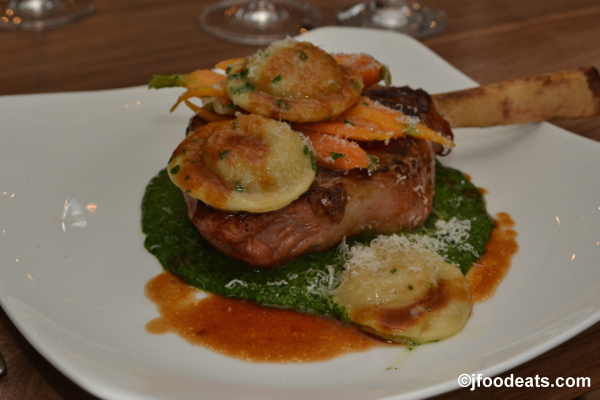 My favorite of the two entrées is the “Wood Grilled Veal Chop” with creamy spinach, veal raviolis, baby carrots, truffle red wine glaze and a touch of parmesan. Chef Leonard told me he sells “a ton” of this entrée and after one bite I completely understand. The chop is perfectly grilled and seasoned, beautifully moist and full of a delicious veal flavor. The spinach is a perfect complement to the veal, slightly creamy with a deep flavor and the veal ravioli are delicate, which pairs well with the red wine glaze. To add a sweet component, the dish includes a few sweet baby carrots atop the chop. Overall this is one of the best veal chops I have tasted in a while. 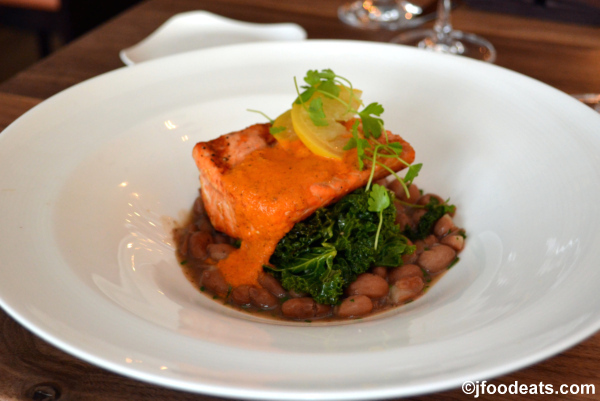 The “Wood Grilled Salmon” with cranberry beans, kale, preserved lemon and charred tomato vinaigrette brings a new dimension to a basic dish. The preparation differs from so many in Fairfield County where a simple grilled salmon filet and vegetables are served. Yes Harvest’s is grilled salmon, but the other ingredients add a totally different flavor profile to this interpretation. The kale and cranberry beans bring earthiness; and then the preserved lemon increases the dish’s complexity with citrus to take the palate in a different direction. This is a salmon presentation to satisfy both sexes. 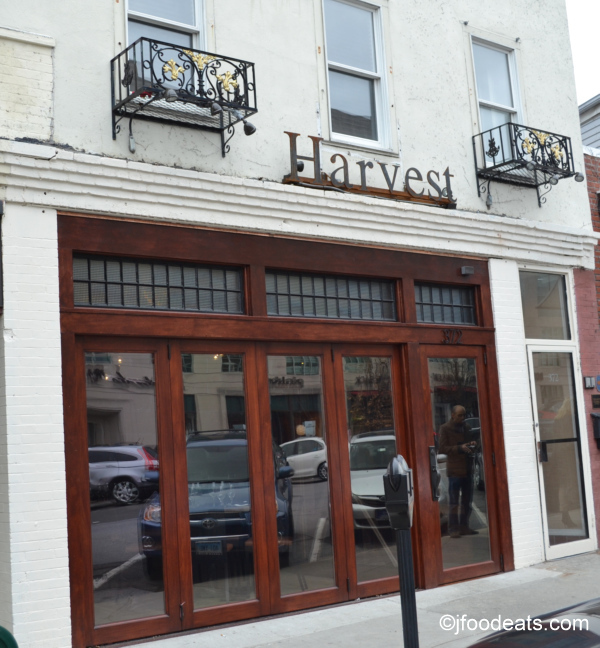 And for those interested in one of the best hamburgers in Fairfield County, Harvest delivers. The “Harvest Burger” is comprised of grass fed, all natural beef (from Minnesota), with Applewood smoked bacon, crispy onions, smoked tomato mayo, Grafton cheddar on a toasted English muffin, served with “everything fries.” This could be the best flavored meat in Fairfield County, a deep rich flavor and with enough fat to absorb a good level of smokiness. The thick cut bacon adds more smoke and saltiness and the smoked tomato mayo augments with just a touch of flavor to the muffin. I was initially suspect of the “everything” seasoning on the fries; but after several fries I am a fan, the poppy seeds bring a new flavor dimension to the traditional salty fries. Harvest has a few fun desserts to end the meal. 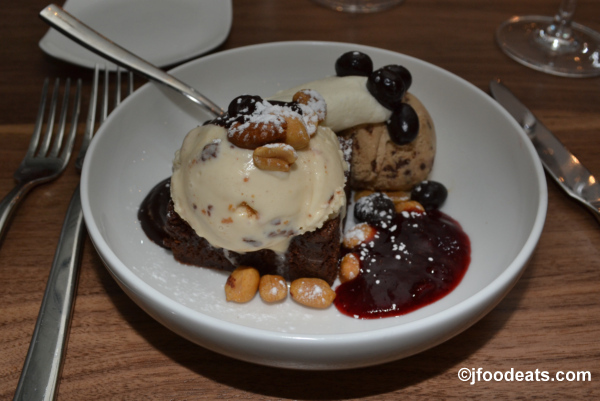 The banana split sundae includes a brownie (which is actually Chef Leonard’s grandmother’s recipe), with two scoops of ice cream, one of peanut butter cup and the other espresso nugget, and topped with strawberry sauce, chocolate sauce, chocolate covered espresso beans and nuts. I really like this dessert and what else needs to be said about a sundae, other than it is a great frozen treat and a perfect and relaxing way to end the meal. After a few months, Chef Leonard and Harvest Wine Bar are preparing some excellent dishes. From crudos to pastas to grilled steaks and chops, the food at Harvest will make this a go-to restaurant in Greenwich. Shake Shack (Westport) – What Happened? 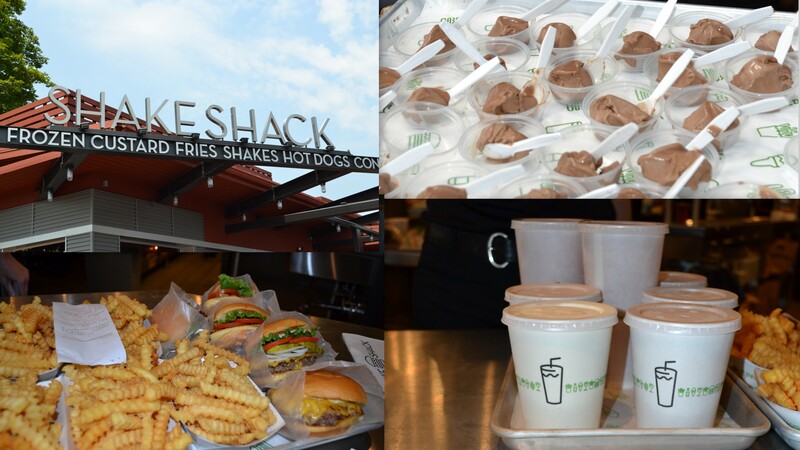 What happened to Shake Shack? What I enjoyed during their opening week when I reviewed for http://www.ctbites.com, has completely fallen from favor, or should I say flavor. The Shack Burger is now some flavorless meat, cooked to medium-rare at least, with two slices of under-ripe tomatoes, a little lettuce on a soft bun. The bun is the best part of the burger. Hard to believe Meyer let this happen. And the fries are better than the opening week, but it is hard to get excited about some frozen crinkle fries thrown in oil and not salted. Too many other choices in the area to want to go back. I really wanted to enjoy Brennan’s, something about a local haunt that supposedly serves great burgers. Unfortunately my tally or the four bacon cheeseburgers was…three overcooked, one raw and only one with bacon. There was a certain looseness and tenderness to the texture of the meat that indicated that the burgers were hand formed on-site. Nice crust on burgers I really enjoyed the flavor of the sirloin meat with its nice, rich, deep flavor did not deliver the juiciness I was expecting, omitted bacon from both burgers. The onion rings were crunchy and the interiors were soft and moist with a good onion flavor. The waffle fries were also crispy while still moist on the inside.